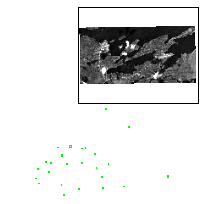 The images in this data set are expected to have better positional accuracy than the AFFM set, due to the use of high-accuracy MTO airport plans for ground control and a higher precision DEM (STRM) for orthorectification. This imagery set is derived from raw imagery acquired by Aviation and Forest Fire Management (AFFM) for native communities in the Far North of Ontario. The imagery was intended to assist MNR staff in determining where structural and environmental values are located in order for fire managers to make critical decisions. These images have been pan-sharpened, orthorectified and enhanced. There are three products available for each community: panchromatic (greyscale), true colour (red, green, blue) and false colour IR (infra-red, red, green). This set of images is available as geo-referenced TIFF and/or JPEG2000 files. The ground sample distance (GSD or pixel spacing) is 60 cm. 28 communities covered by this data set. These communities are: Attawapiskat, Bearskin Lake, Big Trout Lake, Cat Lake, Deer Lake, Fort Albany, Fort Hope, Fort Severn, Kasabonika,Kashechewan, Keewaywin, Kingfisher Lake, Lansdowne House, Martin Falls (Ogoki Post), Muskrat Dam, North Spirit Lake, Peawanuck, Pikangikum, Poplar Hill, Round Lake, (Weagamow), Sachigo Lake, Sandy Lake, Slate Falls, Summer Beaver, Pickle Lake Wapekeka (Angling Lake), Webequie, and Wunnummin Lake. The purpose of QuickBird Imagery is to assist MNR staff in determining where structural and environmental values are located in order for fire managers to make critical decisions.